by ANDREW MCDERMOTT Throughout your journey to overcome online obscurity , you produce a lot of content. 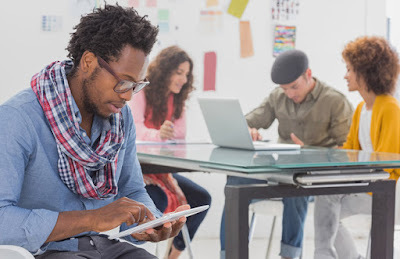 Content marketing is about making a connection with your audience and building relationships. Since you invest time and effort into your writing, you want to see tangible results. But what if your posts aren’t getting the engagement you need to take your digital media platform to the next level? How do you create content that deepens your connection with your audience? The answer may lie in the specific reason why we absorb certain information, while overlooking other content. Emotions almost completely dominate our decisions and experiences. For instance, when we run into trouble or experience a strong emotion like fear, we tend to obsess over it. We can become irrational. Suddenly, our fear overshadows and prevents logical thought processes. When the problem is relieved, we’re free from the constraints of our emotions. We’re more open, agreeable, and compliant. We’re able to think rationally again. Everything starts with emotion. Memories affect our thoughts and opinions; feelings affect our moods and behaviors. The human limbic system is the gatekeeper for all higher thought processing and evaluation. In order to build relationships with your audience, you have to first connect with readers on an emotional level. Because when emotion is missing, we’re not really engaged. If readers aren’t interested and engaged, they’re unlikely to keep reading. And even if they do read your content, they’re less likely to digest it; it’s less likely to make an impact on their lives. You don’t want them to eat your content without absorbing the nutrients, so how do you get readers to absorb your writing? You need to fascinate them. Fascination has the ability to produce intense focus — that feeling you’ve lost track of time since you’ve been completely drawn in to one activity. Fascination enables you to get the emotional response you want. Bestselling author, brand consultant, and Authority Rainmaker keynote speaker Sally Hogshead, commissioned The Kelton Fascination Study and found there are seven basic facets to fascination. Alert (or Alarm) creates urgency. It screams consequences, danger, and loss. It’s the screeching tires that flood your body with adrenaline, the Hells Angel parked next to you, and the police sirens behind you. It focuses on what is most feared, not what’s most likely to happen. Mystique arouses curiosity with unanswered questions. It’s bait pieces, limited access, and unsolved mysteries. Alien abductions and D.B. Cooper. The Bermuda Triangle and Taman Shud. Passion ignites sensory pleasure or experience. It’s emotional, expressive, and animated. Passion uses all five senses. It’s the food blog with photos making your mouth water, the Occupy movement, and divisive issues. Power exercises authority and control. It’s a command over people, circumstances, and self. It’s the man with the gun, people with leverage, and military might. Prestige says, “I’m better than you.” It’s one-upmanship, using symbols of hierarchy, rank, and achievement. The luxury car signaling affluence, your coveted award, and the backstage pass. Innovation (or Rebellion) defies absolutes. It’s taboo and the forbidden fruit. The alluring drive pushing us to break rules and find creative solutions. Eating at the heart-attack grill and nonconformity. The bat suit and the first horseless carriage. Trust builds loyalty with repetition and reliability. It’s about the familiar and predictable — the safety and comfort of routine. It’s a pristine track record and consistent performance. Warren Buffett and Amazon 1-Click. Anytime we’re drawn to something, fascination cues are at play. For writers, using these cues may make the difference between forming an emotional connection with your readers and your content falling flat. Sometimes it’s easier to recognize how others use fascination cues than it is to mix them into our own content marketing. Let’s look at a couple examples. 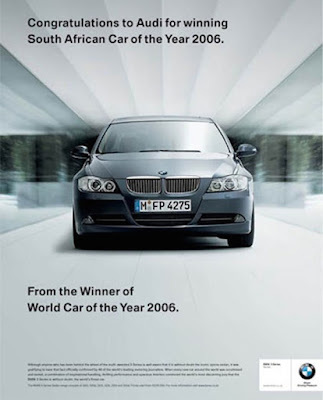 The ad below was part of a series where Audi, BMW, Subaru, and Bentley all tried to one-up each other. As a fascination cue, Prestige thrives on rank, achievement, and hierarchy. Flickr Creative Commons Image via Patricia Gimeno. The following ad is full of mystery, leaving you with nothing but questions. 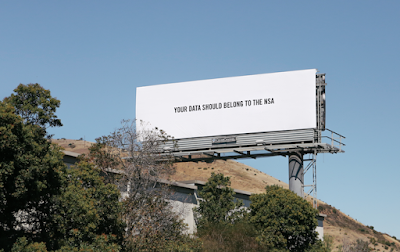 Why should your data belong to the NSA? Who would propose that position? Who’s behind this billboard? As a reader, you’re left wanting more. Image used with express written consent from Bit Torrent. Now that we know what fascination looks like, how can you use it to make your content stand out? Here are seven steps to create content that fascinates. Most writers have a style that works for them, whether they’re creating a narrative story, how-to post, or research report. If you write for another site, the publication will have its own style because audience needs and expectations take priority. Remember, your publisher knows his audience better than you do. But you don’t have to abandon fascination. To create Mystique, begin your introduction with a juicy question that begs for an intriguing answer. Jump in with a descriptive story, tapping into the senses, to trigger Passion. Establish Trust with supporting facts and figures, or maintain a consistent (yet engaging) style your readers can count on. When you have a solid structure, it’s easy to include fascination triggers and connect with your audience emotionally. A focused strategy for your first 50 words and a cohesive outline for the rest of your content will not only make it easier for you to write, they’ll help you create engaging content that’s easy to read. Humans are drawn to problems. They attract our attention, but they also produce stress and anxiety. That’s an important benefit for you when you develop your content because it positions you to present a solution. But, you need to go beyond identifying a problem and get your readers to connect to the emotions behind the problem. Brian Clark demonstrates this with his post, Site Sensor: Website Monitoring for Content Marketers and Online Entrepreneurs. The problem of “website downtime,” by itself, isn’t so compelling, but he agitates the problem by demonstrating that website downtime leads to lost sales and cranky customers calling you out on Twitter and Facebook. What’s the emotional focal point? Alarm, fear of conflict, and loss. The emotional connection is the trigger. Our emotions are fluid. 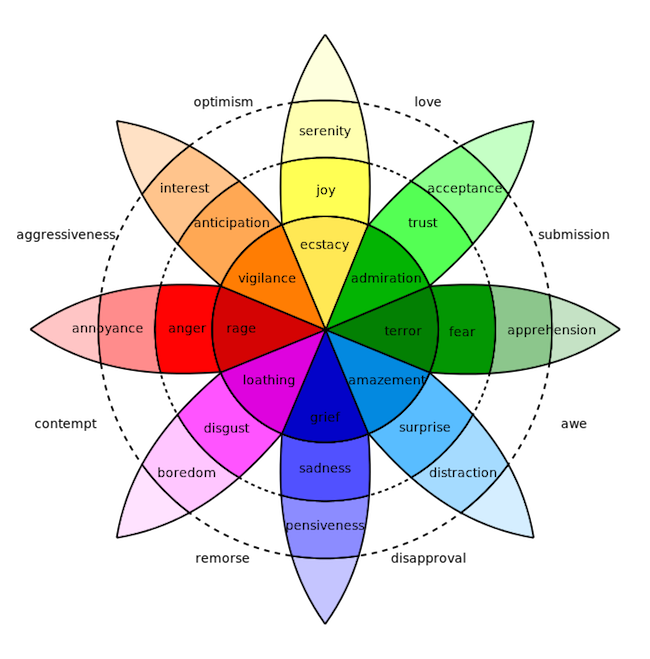 Robert Plutchik’s famous wheel of emotion shows us how multi-faceted emotion really is. Alarm may simply start as apprehension. As the emotion intensifies, it leads to fear and then terror. Wikimedia Commons Image via Machine Elf 1735. You don’t usually admire others unless you already accept and trust them. First, you accept their opinions are valuable. Then you trust them as an authority, which leads you to admire them for their accomplishments. It’s no different if we’re talking about developing trust in a product or service. I accept that your product or service will help me with my needs, I trust you to provide a useful product or service, and I admire you or your business when you meet my expectations. As you create content that matches the problem with the emotion, you trigger interest through fascination cues and build a relationship through emotional connection in your writing. Each emotional step your audience takes with you is a micro “yes.” This is vital in the process of building any relationship. Alarm: You’re afraid of losing customers. Prestige and Alarm: You’re afraid of losing a coveted award. Trust: You want to convince your customers with stats and social proof. Once you’ve identified the emotional focal point(s) behind your problem, you’re prepared to write a compelling headline that will tap into the appropriate fascination trigger. When humans experience an emotional response to a problem, our stress and anxiety is only relieved when we see that the solution mirrors and resolves the problem. If your content doesn’t fully deliver the solution and resolve the problem you initially present, you’ll start to fascinate but end up falling short and frustrating your audience by not completely resolving the problem. The problem: Your site has been down. The agitator: More than an hour has passed, and you don’t have a clue until you hear from cranky people on Twitter and Facebook. The solution: When your site is down, you’ll get an instant notification via email, SMS, or iPhone app. Even if you’re a potential customer, you may be unfamiliar with the extent of potential website hosting issues. You know sites go down sometimes, but Brian shows you just how bad it can get. Once you’re aware of the danger and depth of the problem, he swoops in with the solution, relieving your fear, stress, and anxiety. If the solution doesn’t mirror the problem, there’s no stress relief. The fear and anxiety persists. As you build relationships with your audience, you’ll get more engagement via comments, shares, and subscriptions. More interest and trust will grow from there. If you’ve just connected, that new relationship is fragile. Ask for too much too fast and readers shut down, much like the negative reaction you’d get to a marriage proposal on a first date. You can be fascinated enough to read more — to say “yes” to dinner — but that doesn’t mean you’re ready to buy or ready for a commitment. You need a plan of action. You don’t want to write great content just for the sake of having an engaged and responsive audience. What is your end goal? You should know exactly why you want your readers to be engaged, so you can eventually arrive at your big “yes.” You should convey specific “next steps” at each point along the customer journey. The first step in a marketing relationship is typically education. Valuable educational content provokes someone to subscribe to your website, which leads to more content consumption as you continue to build trust. That’s actually a trick question. Your content plan should guide readers through a series of small decisions and interactions. Each step presents an opportunity for the very next “yes” in the sequence. People either choose to engage and consume your content or they choose to check out and leave. Every point of view, every offer, comes with objections. If your content stands for A, readers will want to know about B. What if you don’t know about B? The problem with objections is they’re often ignored. Let’s look at an objection to the concept of fascinating content. What might that look like? Would that be a reasonable objection? How could you address that? Using emotion to create fascination sounds like emotional manipulation, and it would be, if the problem were artificial or manufactured — if the trigger you use doesn’t truly resonate with your audience. State a real benefit and it’s not emotional manipulation; it’s a legitimate issue that gets attention because it needs attention. And it’s begging for a solution, which you have the opportunity to present in your content. Objections can be easy to miss and easier to ignore. Most of us hate thinking about them, especially when we don’t have an answer to a serious objection. So, many times we run from the problem and avoid addressing objections in our content. But whether or not you address them, objections are there, waiting for an answer. When you don’t address them, they continue to grow, and then all the hard work you put into creating fascinating content is ineffective — the objection becomes a barrier that prevents your audience from taking the next step. Well-written stories are easy to understand. They get us to drop our guard. They fascinate. If readers were a little fuzzy on the details of your post, a relevant story or example can make your point crystal clear. Isn’t fascination just trying to attract attention for attention’s sake? In 2011, Japan was hit with a 9.0 earthquake and a devastating tsunami, followed by the worst nuclear disaster in Japanese history. The sort of disaster no one could have predicted. No one, that is, but Koji Minoura. He predicted the disaster 20 years ahead of time. He published his research in journals and periodicals, but the warning was completely ignored. No one was alarmed or even concerned about his prediction. He shared the problem and evidence for his prediction with the world; historical evidence demonstrated he was correct and the problem was real. What went wrong for Koji Minoura? Did people ignore his research because it wasn’t fascinating? Or did he use Alarm appropriately and the warning was still ignored? Do you see how a relevant example creates clarity? It connects all of the pieces and illustrates the importance of fascination when you have an important message to communicate. As readers, it’s common for us to remember the first and last parts of content we’ve read. Which means text in the middle of an article is more likely to be forgotten. A summary ties your points together; it gives your readers closure. This is your chance to deliver the final touch of your Mystique, Trust, or Passion — whichever trigger you’ve used to fascinate and draw in your audience. You want them to remember what they’ve learned and how they felt. Creating a positive association in your readers’ minds makes it easier to attract their attention, create fascination, and keep getting that micro “yes” each time you release new content. Teaching without emotion is hit or miss because emotion is the gateway to fascination. Follow the seven steps above, and you’ll create magnetic content that fascinates readers and increases engagement. Which fascination trigger are you most drawn to as a consumer? What types of content capture and hold your attention? Do you think certain triggers are easier to use than others? Editor’s note: If you found this article useful, make sure to listen to the recent episode of Rainmaker.FM that features Sally Hogshead’s tips on developing a fascinating and unique position in your market: Keep Them Fascinated: How To Discover Your Winning Difference as a Content Marketer.